These aren’t new releases, just some items I came across at my local library recently. – Shostakovich, Liszt, Prokofiev: Piano Concertos. Lisa de la Salle, piano; Lisbon Gulbenkian Foundation Orchestra, Lawrence Foster, conductor. In this album of first piano concertos what is striking is the effect made by this juxtaposition of pieces: after the goofy fanfares of the Shostakovich it is harder to take the sincere fanfares of the Liszt seriously. It is as though the later composer is influencing the earlier one. The performances are very good throughout if not quite top notch; the Prokofiev does not quite rise to the dazzling level of Kissin and the Berlin Phil. and Arrau commands a more profound poetry in the Liszt. 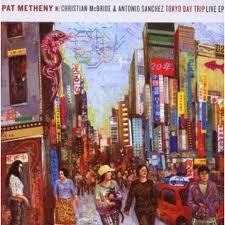 – Pat Metheny, with Christian McBride and Antonio Sanchez: Tokyo Day Trip. I am old enough to remember when the designation “EP” meant “extended play” and referred to a 7″ 45 rpm disc that had more than two songs on its two sides. Now an EP actually means a relatively short CD – long for a CD single, I guess, but short for a CD album; there is about 40 minutes of music here, all of it recorded live. The calmer moods of Metheny’s music can seem slightly spacey – it’s that ECM thing, I guess (the present release is on Nonesuch, actually) – but the uptempo numbers here are fiery ripsnorters. – Bach: Partitas 2, 3, and 4. Murray Perahia, piano. 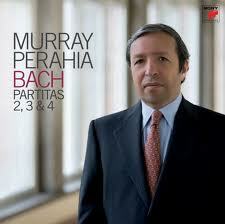 I love Perahia’s Bach playing for its characterfulness – he has a million shades of articulation, and deploys them in intelligent ways. This disc is very nearly at the level of his sublime Goldberg Variations.